Delve into the wonder, mystery and healing power of the subtle body through this interactive workshop. We’ll begin with an introduction to flower essences- sacred plant medicine that facilitates profound shifts in our limiting beliefs and stuck emotions. We will deepen our experience of the rich tapestry of the subtle body through a yoga flow inspired by the wisdom in each of the chakras. Finally, we’ll end in a guided meditation that directs our journey through a celestial garden, weaving the energy of the flower essences through our mind, body, and soul. Flower essences are a profound form of energetic healing, and align beautifully with Chakra work. The Essences are made with the energy of the sun and earthiness of flowers. In this workshop, come prepared to move your physical bodies with Maria Gutierrez-Ferrar from the World Groove Movement and come to stillness in a meditation guiding us through the healing Garden of Flower Essences down the path of the Chakras with Katharine. Learn how the Flowers can assist us in balancing the Subtle Energy of the Chakras, assisting us to direct our energies for both physical and spiritual well being. 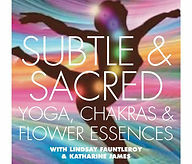 Each participant will receive a Chakra Flower Essence Remedy to take home with them. Our beliefs about healthcare, our health and our bodies are often formed in childhood. Limiting beliefs about how we care for our bodies or about our bodies’ ability to heal itself, are often formed before the age of seven. Helping our children to notice their emotions and how they feel about their world and their bodies will give them tools to take their health into their own hands and help them make the connection between health and emotions. Setting intentions can be a powerful tool, and giving children a voice to express both their desires and feelings in voicing affirmations will give them tools to build upon throughout their lives. Our children are all born with their own personalities. Every personality trait can be very beneficial when balanced, but when it becomes out of balance, these character traits can become areas of unhealthy stress. Flower remedies address both aspects of personality and situations. Flower remedies will address either a situation or an aspect of personality and allow the individual to bring balance into their lives. Teaching our children to notice what it is about their behaviors and feelings they are comfortable with and what it is that they are not comfortable with, teaches them to honor their emotions, and ideally prevent patterns which become stressful. In this workshop, children will be given tools to assist them in noticing and voicing their feelings and start to learn how flower essences and affirmations can help them take control of themselves.